Hydraulic load cells of the HMD series are robust measuring instruments that gauge axial compressive forces with median accuracy. 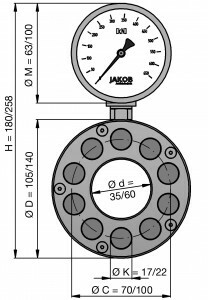 The force is transferred by pressure pistons analogously and via the hydraulic fluid to a manometer with a kN-indicator scale. The measuring system is autarkic so there is no need for external or supplemental power. Therefore, static and dynamic forces can be detected in numerous applications of the entire spectrum of mechanical engineering in an easy and economical way.